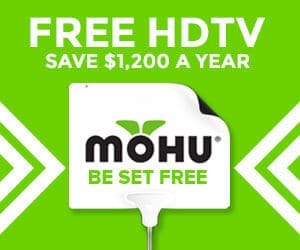 Home » Cord Cutting » TV Antennas » Mohu Promo Code: 25% Off All TV Antennas! Mohu Promo Code: 25% Off All TV Antennas! Mohu is offering fantastic deals at the moment. Currently, there is also a promotion to get 25% off on any purchase at checkout. Now is the time to get a great deal on a fantastic product and say goodbye to cable bills forever. If not for you, do it for your friends and family. They will thank you for the TV antenna now, and then thank you again later for saving them thousands on cable TV. This deal won’t last long, so act now! Clicking any of the 3 links below and entering “super25” in the promo code field will provide you with the 25% off your purchase. Make sure to enter promo after adding the item to your cart..
My family cut the cord and we save over $1000 a year. The best part is we don’t miss any of our favorite shows. The first step is getting that antenna to catch all the free television delivered free over the airwaves. All major broadcast networks are sent over the air in crystal clear high definition. The picture quality is better with the antenna then I ever had with cable TV. We live in a suburb outside Baltimore MD and receive over 35 channels, including ABC, NBC, CBS, FOX, CW and PBS. For an idea of the quality TV antenna products you will receive from Mohu check out my review of the Mohu Sky. It’s the antenna my family uses. It’s small, pulls in every station in my area, and is easy on the eyes. I’ve also tries both the Mohu Leaf, and Mohu Curve. They are easily the best passive indoor TV antenna I have used. All 3 Mohu antennas are Omni-directional making install a breeze. If you were on the fence about dropping cable and cutting the cord to save over $1000 a year, then now is the time. Use this coupon code and start enjoying free HD TV now!